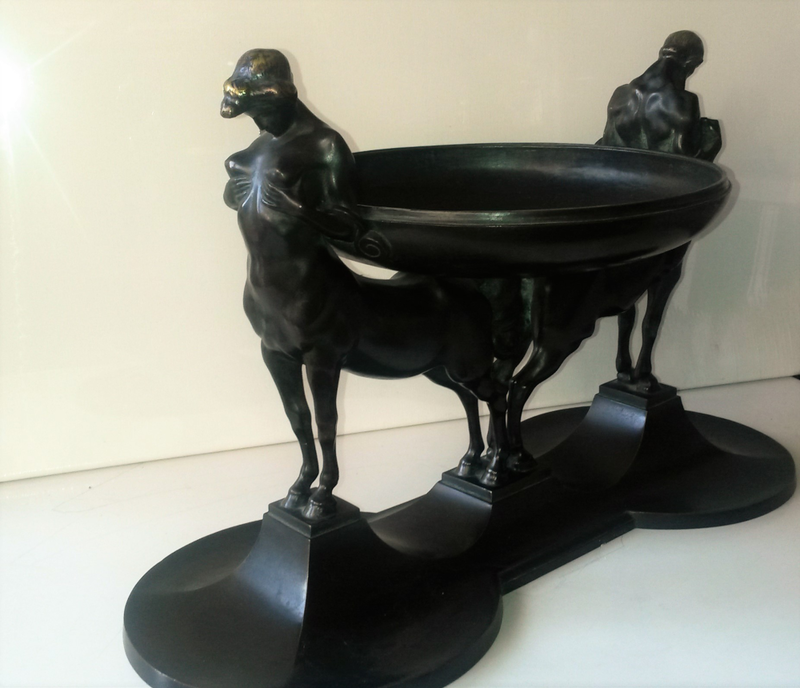 The Kentaurenschale (Bowl of Centaurs) of Hugo Lederer is probably conceived as a fruit bowl. It stood in the living room of my grandparents in Heilbronn and later in Flein on a dresser. The dresser was dark wood (as always in those rooms of people who wanted to discreetly portray their seriousness and their inherent assets) and that is why one wouldn't notice the bowl immediately. I put it on a white desk and when the sun shines even its silhouette appears to be highly sculptural. I use the bowl to store important documents, so it is often hidden. The two figures, on the other hand, rise visibly: Their horses bodies are opposite, one tail is close to the other, so they form a formally large one. They are beautiful horses bodies, rather powerful, not cold-blooded, but not the noble racers. A connoisseur was at work here who thought hard about how to make the middle between the workhorse, who was supposed to carry something, and the mount, which also had to please the eye. The two figures are in the same physical posture, representing woman and man, just as Centaurs (only upper body and head). The respective hairstyle corresponds to the fashion of the turn of the century, you can find them in many representations of Art Nouveau pictures or figures. Anyone who has seen this many times sees it as a reflection of the lifestyle of this time: fast, close to nature, subdued and yet open. The hair is artfully modeled down to the small curl; for a figure (even less than 30 centimeters in hight) an astonishingly precise representation. By contrast, the faces are rather sketchy. One recognizes the respective gender without aiming for a personality structure. What immediately stands out is the gesture: The woman supports her own bare breast with her hands, a gesture of ancient symbolic power; this is supposed to show fertility. It is all the more surprising to find the same gesture in the male Centaur. I can not explain that. The wide, round foundations under the hooves convey an obvious solidity and bond to the earth. I admit, I usually look at this sculpture simply in terms of its forms and the beauty of the material, whose smooth delicacy attracts me. This is daily familiarity. I rarely try to fathom what the artist wanted to say with this arrangement. Of course, the Centaur is an ancient creation of the imagination, which is said to have all sorts of abilities (from irrepressible force of nature to faithful service to man); bipolarity is appertained to it, because it is half human, half animal. The many stories and different depictions of past centuries are included in this presentation and thus cultural high importance is melted down in a small bowl. You can only see that by thinking about it. Just as this period of prosperity of the commoners proudly represented itself socially, so it incorporated ancient traditions from civilization and culture as a symbol. All creativity is applied in order to be in line with those who, according to knowledge and education, are counted among the great ones, who are considered suitable for this by virtue of the origin of history-rich culture. One resorts to the Greco-Roman culture and its forms of expression. Identifying oneself, however, also proves which ideals one emulated. One sees oneself in the tradition of this culture. The just presented interpretation of the sculpture may seem restrained. But I am very cautious, maybe even suspicious, with the criteria and interests of artistic representation of a relative. I fear rash judgments, both positive and negative. We often lack the opportunity, perhaps also the will, to integrate the ideas of our ancestors into our thinking and feeling. The presentation of concentrated power comes to light in another work by Lederer, originated around 1901/02, in an object intended as a fruit bowl (!). This bronze object, titled 'Bowl of Fertility', shows two identical Centaurs standing backwards to each other, holding in the crook of their arms the holding rings of the bowl, which is located on the horses backs. A. Böcklin shows in his 'Battle of the Centaurs' ... to some extent the incarnation of the mythological figures in their inherent, untamed wildness, whereas the centaurs of Lederer (in the human body parts similar to the 'Peyrouse', characterized by design vocabulary) are spanned into something bullish and appear (quite according to their prestige) as a "personification of raw natural power". Ilonka Jochum-Bohrmann: Hugo Lederer, p. 161 f.
Humph, I was very surprised. I looked at my figure again and then (with distress) at the treatise of the highly esteemed art historian. There it was again, this correction of the arguments, this reading of something into the matter to describe what one intended to. First of all, it stands out that there is nothing to be seen from a presentation of concentrated power. Yes, the male Centaur has a strong neck, the arms have muscles. But I've looked at Hugo Lederer's Ringer (wrestler) and the build Peyrouse, it's a different story. If one applies the criteria of masculinity, then the female centaur shows a very sensitive representation of the female body: It is natural and one accepts its physical performance, but there is nothing bullish, nothing of exaggerated physicality in the sense of wild power. The two builds are certainly not identical. These Centaurs are not in a stormy, untamed fight, they are engaged in showing fertility in sublimated form. Today, one would resort to other, more obvious symbols to represent such a topic, all I have to do is think of Picasso. 'Personification of raw natural power' looks different. Lederer probably also had other forms of presentation ready, pursued also other artistic objectives, as he proves here. The art historian must create compartments to show his expertise to assess. What does not fit, is reinterpreted, even if the work itself looks completely different.